Portability, freedom of movement and comfort are only a few of the most important features a CPAP machine should incorporate. Patients who need to use their CPAP machines on a daily basis, quite often even all day and night long, really need high comfort and the ability to transport their therapeutic devices easily. Traveling with your CPAP used to be quite challenging. However, thanks to great advancements in medical technology, many of today’s CPAP machines are small, light and compact enough to be carried around wherever you go. As long as you ensure the battery is fully charged, you can enjoy high quality therapy at home, on the road, while camping, or even traveling by plane. 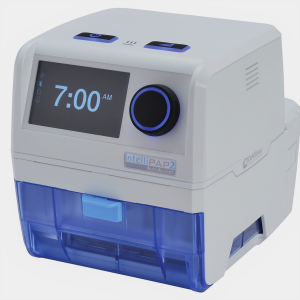 Let’s check out some of the smallest CPAP machines available on the market. 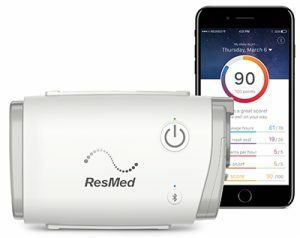 ResMed’s wonder AirMini is considered the world’s smallest CPAP device, weighing only 10.6oz and having the following dimensions: 5.4 x 3.3 x 2.0 inches. The good news is that AirMini incorporates all the settings and therapy modules just as the standard AirSense 10 Auto by ResMed. 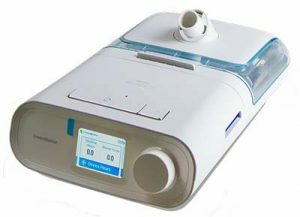 The device also features highly important settings such as AutoRamp so that you can fall asleep on a gentle pressure, EPR or Expiratory Pressure Relief providing a lower air pressure upon exhalation for greater comfort, SmartStart button and also BlueTooth connectivity for easy and quick syncing with your smart devices. Furthermore, the machine can be set up with the HumidX system. This is a small sized, disposable type of humidifier which helps ensuring you enjoy high quality therapy with the right moisture levels coming through the mask. Then, it is important to keep in mind that the AirMini will work properly only with a few types of masks such as the N20 Nasal Mask, the AirFit P10 Nasal pillow mask and also the F20 Full Face masks. 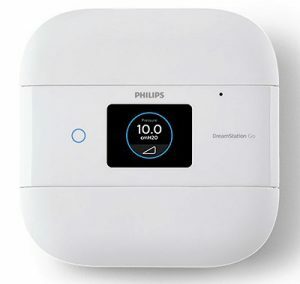 This is an ultra-compact, small, light and quiet CPAP machine incorporating quite a few unique features. For example, TRANSCEND is capable of auto-adjusting for altitudes up to 8,000 feet. This feature makes the Transcend perfect for hiking, camping or traveling while you can still enjoy prescribed therapy. 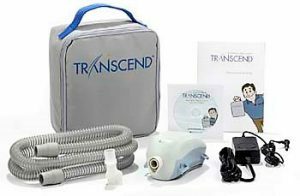 Also, the Transcend CPAP can be fitted with all masks, it is basically vibration free at any setting, and it is also very quiet at only 28dB. Patients can easily record their therapy data for up to 13 months. In order to keep track of your therapy data you just need to set up the TranSync which you can use for free. Some of the therapeutic details that you can track using TranSync include: AHI leaks, Minimum and Maximum therapy pressure, Total hours of therapy, therapy sessions, leak detection and more. DreamStation Go is designed with high portability and comfort in mind. 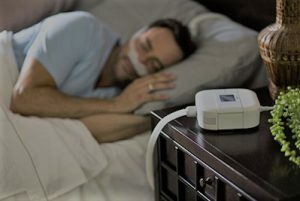 Patients frequently traveling, definitely like using this small CPAP as part of their daily oxygen therapy requirement. The DreamStation Go never compromises on quality of the therapy provided, yet it has 1/3 fewer parts than any other travel CPAP machine within this range and of similar capacities. DreamStation Go also ensures maximum freedom of movement, thanks to its slim 12mm tubing system which is less bulky, thus definitely improving mobility. In case you are familiar with the patented Flex technology of the regular sized DreamStation and System One CPAP machines, you should know DreamStation Go is also equipped with Flex technology. Flex will help evaluating the patient’s breathing pattern and thus delivering the correct pressure relief at the beginning of each exhalation phase. Flex technology conforms to the patient’s natural breathing patterns, delivering the most comfortable therapy on a breath by breath basis. This is an intelligent CPAP machine with auto adjusting pressure, delivering correct therapy on a breath by breath basis. The device offers maximum comfort for patients and it has an extremely small size at only 6.1 x 7.6 inches making this machine perfect for traveling. The device operates very quietly too, at only 26.6dB noise level, but it has a large color display for easy setup and navigation. The machine is further equipped with a wake-up alarm function, auto-adjusting pressure setting, and even a heated humidifier to deliver perfect air at the most comfortable temperature and moisture. DevilBiss IntelliPAP 2 is also equipped with SmartFlex pressure relief, which ensures to provide a lower pressure at the start of exhalation for enhanced comfort during therapy. Patients can opt for the PulseDose heated humidification system which helps greatly in managing rainout within the tubing. The humidifier will deliver air which is moist exactly when the patient needs it. Upon the inhalation phase the moistened air will be delivered into the mask, while upon the exhalation phase the machine will deliver dry air thus eliminating the risk of rainout. DreamStation Auto by Philips Respironics is a sleek and stylish machine equipped with extremely powerful functions. It has an intuitive menu, the setup is quick and easy while the humidifier is strategically placed so as to be used with maximum comfort while sitting or lying in bed. The device is small and compact in size, barely taking up space on your nightstand. DreamStation delivers a whisper quiet operation regardless of the pressure setting, thus ensuring a comfortable and quiet night of sleep for both the patient and the bed partner. The device can also be set up with C-Flex or A Flex technology. The Flex technology helps making the pressure transition from inhalation to exhalation much softer. Mask fit check, advanced event detection, Oximetry control or DreamMapper integration are only a few more advanced features the DreamStation is equipped with.